This is a brief chronological sequence of significant events in the history of Castle Cornet, from its thirteenth century origins to the present day. The earliest parts of Castle Cornet date to the 13th century. In 1066 when William Duke of Normandy became William I, King of England, the Channel Islands became possessions of the English Crown. In 1204, King John lost control of Normandy but the Islands remained in the possession of the English Crown. As a result there was the need to defend the Channel Islands against the French. The construction of Castle Cornet commenced shortly after this date. Castle Cornet was built on a small island off the coast of Guernsey, to defend the busy trading harbour of St Peter Port. It had a strong natural position, surrounded by the sea and only accessible on foot at the lowest tides. Before the enlargement of the harbour and the building of the Castle Emplacement Castle Cornet was nearly a mile off the shore of Guernsey. In September 1338 the French attacked and took Castle Cornet. They held it for 7 years. Castle cornet was recaptured by the English. The Castle was severely damaged during these conflicts and a significant amount of rebuilding had to take place. Gunners Tower was constructed. It was the first tower built to take canon. In the 16th century cannon became increasingly available and were more readily used as a means of attack and defence. New fortifications were required to not only take cannon but also defend against them. During the reigns of Henry VIII (1509-1547) and Elizabeth I (1558-1603) successive island governors supervised the building of new outer walls and fortifications around the medieval fortress creating the basic outline of the Castle still seen today. Paul Ivy, the foremost military engineer during this period designed the Tudor extensions to the Castle. Incorporating artillery around the castle walls provided substantial protection. The earliest of these extensions was the Mewtis Bulwark built in 1550. It was named after Sir Peter Mewtis, the governor of Guernsey at the time. 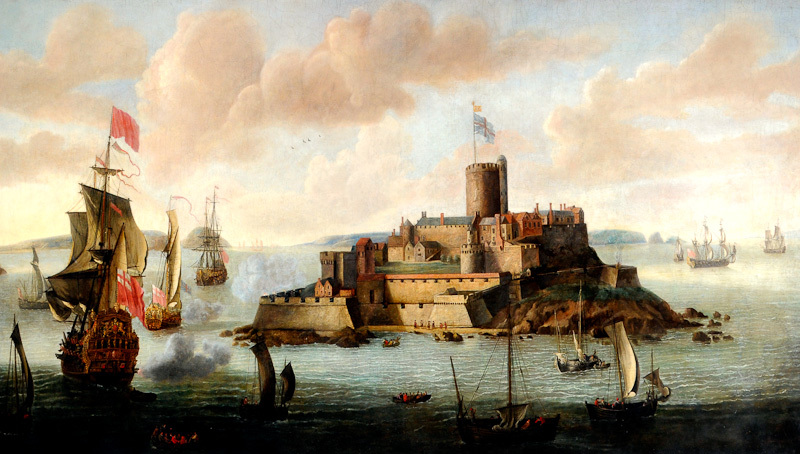 A Commission under Sir Francis Chamberlayne, the then Governor of Guernsey, reported that the Castle needed repair and updating as artillery had continued to advance and most of the fortifications at Castle Cornet were considered obsolete. Sir Francis did make one improvement before he left office in 1570 - the construction of Chamberlayne's Mount on the west side of the citadel. Other proposals made by the Commission of 1567 were carried out in a modified form by Sir Thomas Leighton (Governor of Guernsey 1570-1609). Most of the outer walls and great bastions or bulwarks now called the Town Bastion and Royal Battery were constructed during this time, as was the Castle Gate and the Hart Bulwark. 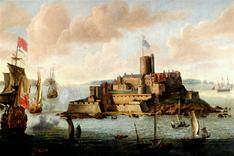 At the outbreak of the Civil War in 1642 Guernsey declared for Parliament, Castle Cornet, under the Governor Sir Peter Osborne, remained loyal to King Charles I. The Castle was under siege throughout this period. There were regular skirmishes with both the Castle and St Peter Port suffering damage from each others guns. Castle Cornet was the last Royalist stronghold to surrender in 1651. After the Restoration of 1660 the Castle was fully maintained as a fortress. Major-General Sir John Lambert was held prisoner in the Castle. Charles II banished his opponents and Lambert was sent to Guernsey. He was a keen gardener and while in the Castle he was allowed to devote his time to horticultural interests. A garden within the Castle, based on late Tudor designs, bears Lambert's name. On the 29th December 1672 the donjon or keep of the castle was hit by lightening. The living quarters of the Governor, Lord Hatton were destroyed together with the medieval Great Hall and the chapel. They were never rebuilt. Lord Hatton survived but his wife, mother and five other people were killed. After this accident no Governors ever lived in the Castle again. By this time the Castle stood well within the range of artillery positioned in St Peter Port. However, with increasing international tension in the mid 1700's it still served as an important fortress, armed with over 70 guns and a garrison of up to 300 men. During this period several new barrack buildings were added to the Castle to house an enlarged British garrison. The Lower Barracks was built around 1745 and housed men of the Royal Artillery who manned the castle guns. The Upper Barracks was designed by John Henry Bastide and built between 1745 and 1750. It housed four companies of infantrymen. The Hospital building was built in 1746, although it did not serve as a hospital before 1789. After 1855 it was used as a canteen. The citadel, found at the top of the Castle, contains a range of bombproof casemates built as a means of increasing barrack accommodation. By 1800 the Castle was considered to be inadequate as a garrison stronghold and Fort George replaced Castle Cornet as the main barracks for the island. The harbour was extended and a wooden bridge built to connect it to Castle Cornet. The bridge was replaced with the concrete structure seen today following the Second World War. Two 12-pounder quick firing guns were installed on the citadel. During the German Occupation of the Channel Islands the castle was known as Stuzpunkt Hafenschloss (Strongpoint Harbour Castle). Through the Second World War it housed Luftwaffe flak (anti-aircraft) units. Many modifications were made to the castle during this period as the defences once again had to be brought up to date for modern warfare. Many structures from this period including personnel shelters and gun emplacements can still be seen today.